The period of 20th Century furniture making has seen some extraordinary diverse craftsmen and designers. If one starts close to home in Devon, the firm Shapland and Petter in Barnstaple is synonymous with craftsmanship. The company was founded by Henry Shapland and Henry Petter at the Raleigh Cabinet works and much of their work was of Arts and Crafts influence. An impressive Art Deco walnut and coromandel veneered dining room suite (FS28/922). Charles Voysey was at the forefront of 20th Century furniture design. His early work was as a designer of wallpapers, fabrics and furnishings in an Arts and Crafts style, but he was also an architect of a number of notable country houses. Ernest Gimson was arguably the most influential of designers in the Arts and Crafts movement. As with Voysey, he was also an architect and in Devon he designed a house at Budleigh Salterton call Coxen. The 20th Century owed a legacy to the innovation of William Morris whose designs, particularly in wallpaper and fabric, have an everlasting appeal. The 20th Century has such a wealth of designers and Charles Rennie Mackintosh and his design for the chairs at the Willow Tea Rooms in Sauchiehall Street in Glasgow are iconic. The Willow Tea Rooms were also designed by Mackintosh in the Art Nouveau style and were opened in 1903. Sir Edwin Lutyens was also noted not only as the greatest architect of the 20th Century but also as a designer of furniture. The last castle built in England was designed by Lutyens and features amongst other items a table specifically designed for the kitchen. A number of Lutyens pieces also feature at Lindisfarne Castle in Northumberland. 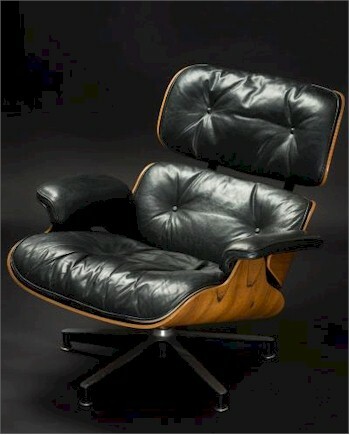 Charles Eames (1907-1978) and Ray Eames (1912–1988) – A lounge chair for Herman Miller (FS26/988). Towards the end of the 20th Century, a number of great furniture designers and makers have appeared including John Makepiece whose workshops are based at Parnham House in Dorset. He commented "My passion is to create great masterpieces that enrich peoples lives and the language of furniture". This could have been said by any of the aforementioned furniture designers and makers whose works along with those of Makepiece have stood the test of time and will continue to do so.